Post-revolution Cairo, as it is now considered, is an uneasy landscape. Though the Egyptian flag flutters from almost every balcony and above most shop doors, the revolution is considered by most as being far from complete. There is an apprehension in the air; nervousness about what the future holds. Shops and banks have reopened and life is returning to some semblance of normality, but reminders of the recent change the country underwent are still conspicuously visible, from burnt out cars on the road to the tanks parked outside important government ministries. Economic pressure and a split in opinion over the army have created an uncomfortable stalemate. Protests continue in Tahrir Square daily, and some worn tents are defiantly erected day after day. The word ‘protest’, however, especially when followed by ‘Tahrir Square’, has lost the respect it commandeered in the first weeks of the revolution. Though there is no question about protesters’ right to continue to fight until their demands are met, a gulf has emerged between those defiant in the face of army rule and an unchanged government system, and those who accept the reforms slowly being introduced and are keen to return to pre-revolution routine. The question of the economy is being used tactically by the army to impose civil order on Egypt, including the enforcement of a midnight curfew. Egyptians who continue to protest are accused of preventing economic recovery, one of the central aspects to building a ‘new Egypt’. 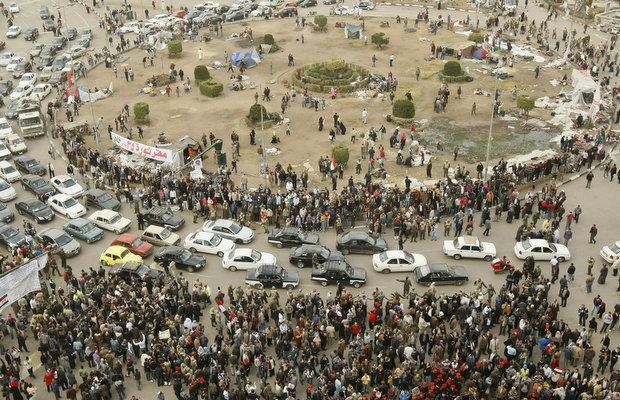 The protests against Mubarak unleashed a flurry of other protests on long-standing social and economic issues. Indeed the anti-Mubarak protests were themselves greatly strengthened by strikes called by Egypt’s labour unions, made up of doctors, lawyers, teachers and public transport workers. The long-term demands of workers who participated in the revolution, and other deep-seated grievances which stretch far beyond Mubarak and his departure, are yet to be addressed. Universities remain closed in an attempt by the army to avoid a broad student movement for wider reforms. There have been demonstrations outside the Ministry of Education this week attended by hundreds of students to demand the reopening of the universities, but the situation remains unclear as the army continues to extend the university ‘holiday’ at the end of each week. A number of key demands are yet to be met, including the lifting of the state of emergency, the removal of the curfew and the ousting of members of Mubarak’s cabinet who still hold their positions. Although a broad consensus exists that these demands are vital to the future of a new, democratic Egypt, it has been difficult, without a clear adversary (the army is still widely respected for its behaviour during the revolution), to draw large crowds to protest on specific issues. Instead, every Friday, Tahrir Square is transformed into a kind of carnival, with music, flags and street vendors selling food and revolution memorabilia. On one of the streets leading off from the square, a small protest takes place outside a ministry or parliament building, just a hundred people strong. There have, however, been calls for a pan-Arab movement, and though the revolutionary spirit has been somewhat dampened by the drawn-out presence of the army, the attitude of most Egyptians towards other Arab countries has significantly changed. Solidarity is the norm, and has overtaken long-standing grudges against neighbouring countries. The basis of this Arab union is usually considered Tunisia and Egypt, although theoretically it could include Libya, Algeria and Morrocco. A sense of national pride has been renewed after the revolution, manifesting itself in people fulfilling roles where the national government has always been neglectful. A small example is a series of small plastic bins that have been attached to lampposts and trees in downtown Cairo with small signs encouraging citizens to take pride in their streets. At times, the revolution can feel like a distant memory, surfacing only when a street child proffers you his latest wares through the window as you sit stuck in a traffic jam: stickers in the style of an Egyptian number plate with ‘25th of January’ written across them. The revolution has been quickly commercialised, and the term is so loosely thrown around that it has lost much of the meaning and depth that it held at the height of protests when Mubarak was still in power. The stalemate that exists, however, will eventually have to come to an end, and whether it is the protesters or the army who give in first will be telling of Egypt’s future. Jumanah Younis is a writer and activist. She is studying Spanish and Arabic at Pembroke College, Oxford, and is currently living in Cairo.